Want truly world class viscosity baths? Come to us. We offer you viscosity bath with highest stability of temperature which can work decades without servicing running for 24X7. We have viscosity bath which can go as low as -60°C with a stability of 0.01 K and as high as 230°C with again stability of 0.01 K. As per the application and budget viscosity bath made of polymer, Glass or Stainless steel can be offered. Our control heads comes with adaptive control technology which changes the control parameters as per the environment changes to give you the stability we promise. 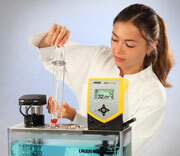 LAUDA viscothermostats are the solution to thermostating all glass capillary viscometers. With their wide temperature range, the control heads of Proline and ECO meet the high requirements of viscosity measurement (ASTM D445, ISO 3105, and DIN 51562). High degree of transparency and homogeneous lighting guarantee good inspection of the measurement processes. Numerous advancement options (e.g. 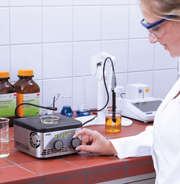 magnetic stirrer, additional cooler, temperature sensors, and software) optimize the range of applications possible. The new Viscocool and Viscotemp viscothermostats are sensible add-ons to the Proline PV and ECO ET. The Viscotemp models supplement the robust stainless steel thermostats with a very good price-performance ratio. The new Viscocool 6 is equipped with integrated Peltier cooling which enables thermostating at up to 15 Â°C below room temperature in compliance with standards. With the Omnicool thermostats, LAUDA is forging ahead in new dimensions of coolant-free mini-thermostats. Being extremely compact, they stand for the swift, direct and highly dynamic thermostating of small sample volumes. Optimized for a sample volume of 100 ml, the Peltier thermostating cell enables electronic heating and cooling in minutes with the highest degree of control accuracy. With Omnicool 62 Plus even low and high viscosity fluids can be well mixed thanks to the integrated mini-magnetic stirring unit. This means that temperature homogeneity is guaranteed at all times. For highly precise, dynamic applications the temperature can be determined with an external sensor immersed in the sample. With the new Omnicool thermostats, LAUDA offers a new flexible thermostating option for versatile applications.